Prudence is a wonderful 8 bedroom villa in Barbados located in Old Queen's Fort, St James' on the West Coast. Old Queen's Fort, is an exclusive private road leading to the beach. The beach is just a three minute stroll from Prudence. Prudence has 5 bedrooms in the main house (2 upstairs and 3 downstairs) and 3 bedrooms in the cottage (1 en-suite and 1 other bathroom shared). The 8 bedrooms in Prudence are all tastefully designed. They all have travertine floors and modern bathrooms, safes, air-conditioning and ceiling fans. There are 2 master bedrooms so if two families are sharing everyone is happy. Prudence does not have to be rented as an 8 bedroom rental but can be rented by taking rooms in the main house and additional rooms in the cottage if required. Prudence Barbados offers a fabulous 45 ft free form swimming pool. It has lovely coloured pool lights that create a magical setting at night as well as 8 pool loungers. There is also a lovely gazebo with a coral stone table which seats 8 to10 people. In addition there is an outdoor gas fired BBQ nearby. This is the perfect spot for al fresco dining and entertaining guests under the stars. The dining room has a large table which seats 14 people. There is also a smaller 8 seat coral stone table nearby. There is a lovely bar with seats for pre dinner drinks. Comfortable lounge furniture in and outside of the house provides the ideal place from which to enjoy Caribbean cocktails. Rentals come fully staffed with 1 butler, 1 cook and a housekeeping team comprising 3 lovely ladies. All the staff are friendly and efficient and aim to make your stay relaxed and memorable. Jackie the head housekeeper will ensure that all your needs are attended to! If any additional staff are required we will be pleased to arrange this at the guests' expense. There is a media room and study downstairs. All 5 bedrooms in the main house have Smart TVs and wifi. The master bedroom in the cottage also has cable TV. Prudence has Lutron lighting and an entertainment system throughout. There are also security cameras for your complete peace of mind during your stay. There is a secure parking area in front of the house for 3 to 4 cars. Perfect for a large family or groups of friends!! • 3 minute Stroll to the beach via private beach path. • 1 mile north of Holetown. Copyright © Barbados Dream Villas 2019. All rights reserved. Worldwide Dream Holidays Ltd is a company committed to customer satisfaction and consumer financial protection. We are therefore pleased to confirm that, at no extra cost to you, and in accordance with ''The Package Travel, Package Tours Regulations 1992'' all passengers booking with Worldwide Dream Holidays Ltd are fully insured for the initial deposit, and subsequently the balance of monies paid as detailed in your booking confirmation form. 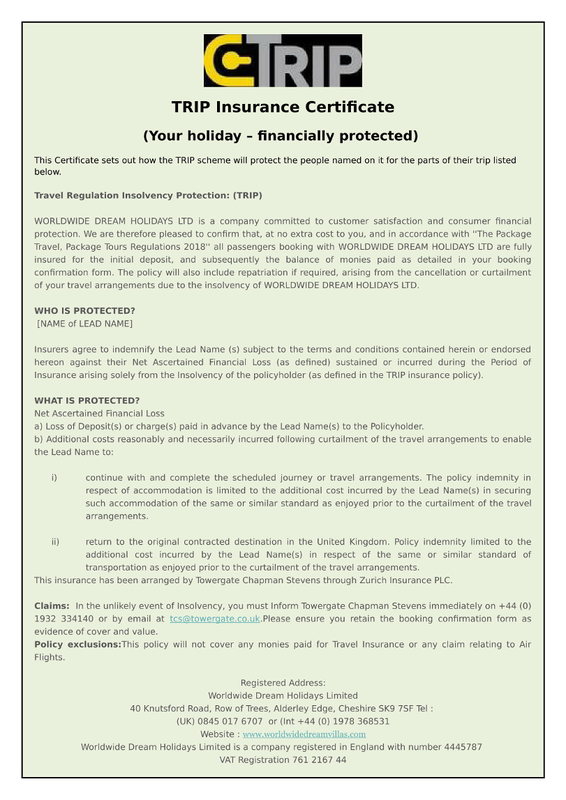 The policy will also include repatriation if required, arising from the cancellation or curtailment of your travel arrangements due to the insolvency of Worldwide Dream Holidays Ltd. This insurance has been arranged by Towergate Chapman Stevens through Zurich Insurance PLC. Book with Confidence. Financial security - We guarantee that all holiday payments (deposits/balance) will be passed on in full to the property owner/manager prior to your clients’ stay. Worldwide Dream Holidays Ltd carries TRIP financial failure insurance (Travel Regulation and Insolvency Protection) so that your client is covered in the unlikely event that we become insolvent before their date of travel. Unlike some rental companies we do not charge additional booking fees on top of the price we quote you for your holiday. We do not ask for 100% payment at the time of booking unless the booking is made within 10 weeks of arrival. A 30% confirmation deposit is usual apart from Peak times when it may be 50%. Any additional taxes, levies and service charges will be itemized in your quote. Some service charges may apply for on Island concierge services.